No meaningful progress can be made in Theosophy if we only read about it and do not practice it. If we only read about Theosophy we also run the ever increasing danger of forming profound misconceptions about the significance and meaning of the deeper teachings. Many lifelong readers of Theosophical books are under the illusion that they understand Theosophy and often lead new students astray with their strongly held and erroneous notions about the spiritual significance of the deeper teachings. Tranquillity: [shad-sampat] Control of the Mind. There is a profoundly deep and peaceful calm within all of us. It never goes away, we encounter it in deep dreamless sleep and it restores us every time. That calm in the depths of the Self is still there throughout the most anxiety filled days you have ever experienced. Ultimately Tranquillity is about dwelling within that deep sleep calm while fully awake. Should you accomplish this in a sustainable way you will be enlightened. It is often a “glimpse enlightenment moment” in this deep state of profoundly liberated calm that inspires lifelong meditation. Touch Taste Smell Hearing Sight. These senses are entirely innocent, in and of themselves, but they can become corrupted by the ego-personality. When you are awake to yourself you discover that your senses are each performing two functions instead of one. Conditioned likes and dislikes have entered into your senses and distort their proper functioning. Each of the Five senses can develop conditioned responses and reactivity. Basically this means that the senses are burdened by past baggage which is to say Skandhas. You can hear perfectly well without the ‘listener’ for instance, which is always there to keep you out of present time, by comparing everything you hear to the past. Or the ‘taster’ drinking the ‘conditioned idea’ of a cup of tea and not this particular cup of tea which is being tasted now. A corrupt sense of taste is inevitably related to addiction. The ‘looker’ is conditioned to see some things while it remains blind to others. Touch is most often conditioned and corrupted sexually in the demand to mechanically repeat known sensations. Smell so strongly related to memory is dulled in most people living in large smelly urban centres. Through meditation practice and remaining in the present the senses are cleared of their conditioning and come back into awareness in a new way. Renunciation: [uparati] of all activities that are not duties. Renunciation does not involve what we usually think of as will or resistance. However it does involve disengagement from those activities and states of consciousness which obstruct or hinder a healthy and wholesome spiritual life. Renunciation demands an “attitude towards all existing things which is not love not hate and not indifference”. Renunciation is the direct result of a “moment of clarity” regarding a particular spiritual obstruction. This meditation practice when sustained brings us to these “moments of clarity”. When the obstruction is seen with total clarity it ends right there. Renunciation may also involve lifestyle changes and alterations in social activity. This meditation practice presupposes that you abstain entirely from the consumption of alcohol, recreational drugs, or prescription drugs which have a mood altering effect. This is included implicitly in “self-Control and Renunciation”. The use of Alcohol and Drugs in any quantity are serious obstructions and this meditation practice should not even be started until these obstructions have been Renounced. There are no exceptions to this rule. At its deepest level endurance is the result of having woken up to the reality of ones higher Self. “Perpetual presence in imagination in all space and time”. Endurance also means developing a meditation practice and staying with it every day 365 day per year and ideally and preferably always at the same time at the beginning of your day. Inevitably there will be times when meditation causes discomfort. The ego-personality is well known to produce overwhelming cravings, backaches and extreme itches, even panic in order to break meditation. Endurance in this context means “no reaction” continued calm breathing and continued watching of the mind without interference or reaction. Theosophists have exceptionally strong faith but it is not Faith in any Anthropomorphic God or indeed in any agency outside the Self. At the same time Theosophists are in no way narcissistic or Self worshiping. Theosophists have Faith in the Self which is the Child of the Logos which in turn is the direct emanation of the Absolute. Faith in the Cycle of Necessity, and the Law of Karma. Faith in the Law of Compassion. 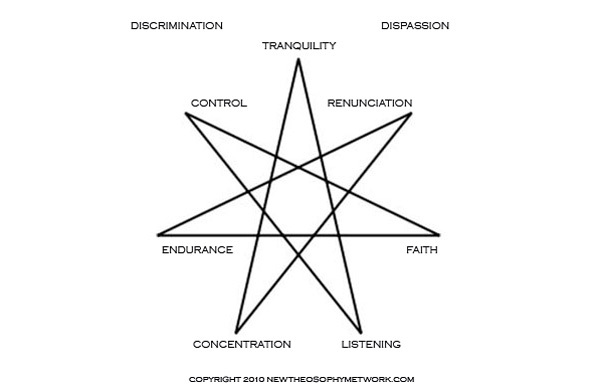 When you have reached the stage where you have stabilized and integrated the Seven Virtues grounded in Discrimination and Dispassion, Concentration is perfected. You will be in absolutely no doubt about whether or not you have reached this state. “Perfected” just really means; it works. There will be a radical and stable change in the higher levels at which you are capable of being aware. Importantly you will be able to go to those levels in a reliable and repeatable way. Important too is the fact that you will be able to choose in any given moment what level of being and awareness you wish to function from. Having attained this higher level integration you will find yourself acting with integrity in every situation. It is possible to have an intuitive grasp of how this highly integrated state, is the Enlightenment that leads to Liberation. Essentially “Listening” is listening to “silence”. That silence is always with us in the background of every sound we hear. When Concentration is ‘perfected’ we discover that the immense silence within us masks something on an even deeper level. From within the immense inner silence there arises the “voice of the silence”. The state leading to the ability to hear the “voice of the “ silence is called Dharana, which is simply a synonym for “concentration perfected”. It is not possible to reach Dharana without practicing this meditation combining the Seven Virtues as here described. There may be claims about other methods but the approach taken here is the safe and sure theosophical approach. Liberation: [mumukshutva] all of these practices must take place in an inner life characterized by an Intense longing for liberation from temporal limitations. Easy enough to see that the sustained practice of Discrimination and Dispassion make all Seven Virtues possible. It is of crucial importance that we understand that Discrimination, Dispassion and the Seven Virtues be developed and entered into simultaneously. This is of crucial importance because an uneven development of the bridge [antakarana] between the lower self and higher Self can produce unfortunate problems which are very difficult or impossible to correct later. Happy and blessed Meditating!